Road Scrap delivery demands extreme efficiency and accuracy. Unfortunately, due to the complicated nature of the scrap metal distribution, the prevention of the fraud is a major task. Our system uses the new technology such as network camera at the weighbridge, hand-held scanner for the scrap inspectors to record the movement of the lorry and its load. The inspector can use the hand-held device to accept or reject the load, downgrade or deduct the scrap due to the poor quality. The photo of the poor quality scrap can be transferred into the system so the complaint can be filed immediately. The system allows the driver to check out by using the barcode ticket. Once the ticket is scanned and the photo of the lorry will be taken again and receipt will be printed automatically. There are a set of comprehensive reporting tool for analyzing the scrap delivery including the scrap quality performance against each scrap merchant. The system uses the RFID tag to identify each wagon automatically when going through the rail weighbridge. It can treat the wagon as a temporary scrap stock location. The content can be transferred to a physical scrap location or loaded into scrap basket. 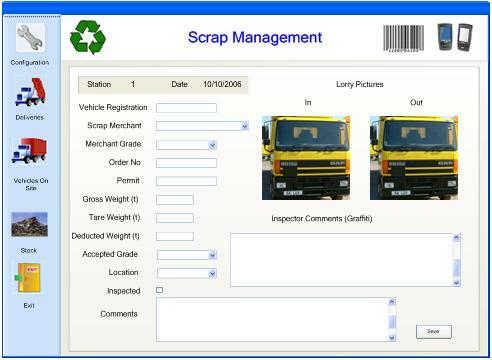 The scrap inspector can identify the content of the wagon by scanning the RFID and conduct the same scrap inspection as the road delivery. This module working together with the Basket Loading module can provide the real time scrap inventory information and historic transactions. 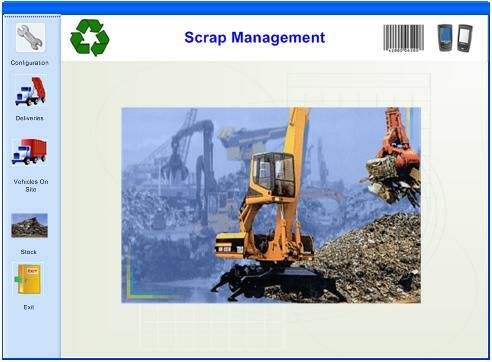 The scrap inventory is regularly checked and audited by the stock take or ‘zeroing’ the stockpile. The scrap inventory information will help the scrap purchasing to make the right decision on when, what and how much to buy. This could reduce the scrap inventory LEVEL and make significant savings.